So much information in 90 minutes. I was not taking notes. It was more like watching a movie. The life of a visionary. His home, workspace, thoughts, time. There are no pictures on the walls. A smile from our guide. Yes, Mr. Wright thought the architecture, the wall itself, was art enough. Expansion, contraction. Counterpoint. Music in geometry. 6th Century poet. Welsh ancestors. So much information, flowing like water. Frank Lloyd Wright practiced his trade up until his last year (d.1959), leaving several projects to his apprentices. Five of those apprentices still live onsite in dorms built when Taliesin West (pronounced “Tally-essen”) was the western hub of Mr. Wright’s practice. This is where he worked six months a year. Where everyone lived. If you take a 2-week or 2-month course of study at the School of Architecture at Taliesin, this is where you will live. Heck, go full boat. The comprehensive program towards a professional Master of Architecture (M.Arch). Have a family? No problem. Onsite apartments for the husband (or wife) and kids are available. I took the basic Insights Tour. The first tour of their new 8:45am time slot on a Friday. A perfect May day in the desert. Bees enjoying the spray from tumbling water. A heck of an informed, passionate tour guide. The eastern horizon dropping below the sun, just as Mr. Wright saw it. The surrounding few hundred acres looks just as it did in FLW’s time. Beyond, much new construction. Viewing the Papago Mountains and Camelback, power lines obstruct our view. What would Frank have said? He did say, actually. 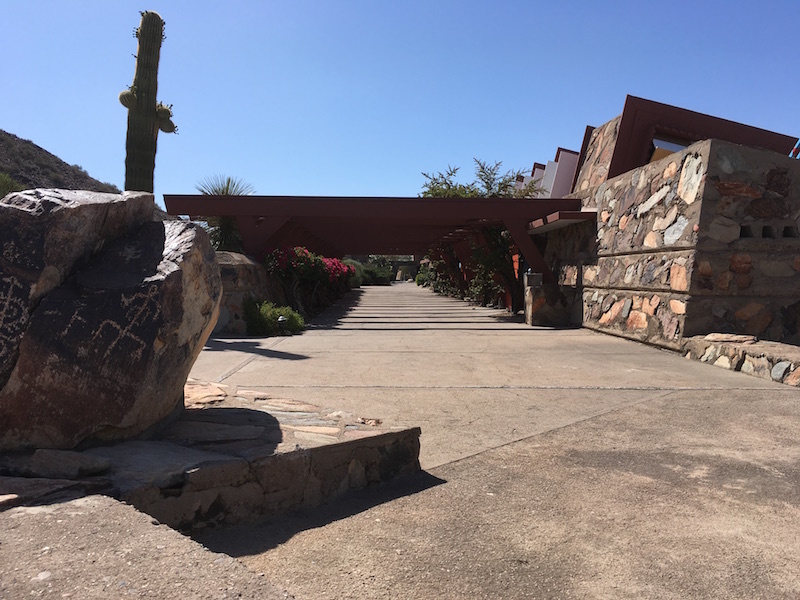 This entry was posted in Craftsman / Artist and tagged Insights Tour, School of Architecture at Taliesin, Taliesin West, Thomas Swick Frank Lloyd Wright.